History of the Montessori Movement - Peace Montessori School |Toddler, Preschool, Kindergarten, Elementary & Middle school programs in Fort Wayne, IN. Dr. Montessori based this new education on her scientific observations of young children’s behavior. In 1907, she was invited to open a childcare center for the children of Rome, Italy. Having observed that young children learn best in a homelike setting, she called it ”The Children’s House” and filled it with developmentally appropriate materials that provide experiences contributing to the growth of self-motivated, independent learners. Dr. Montessori’s Method of Education cultivates the child’s own natural desire to learn. She believed that young children have a universal lifetime ability to absorb knowledge from their surroundings just by living. The child’s mind is at its most receptive during these early years. In order to be calm and happy, children need to explore and discover. The Montessori environment, both inside and outside, allows the child to move, touch, manipulate, and explore. In his environment, he learns to work independently, based on his own initiative, building concentration and inner discipline. 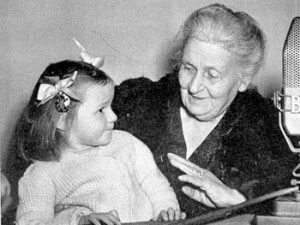 For a century, Dr. Maria Montessori’s beliefs have remained true. In 2007, we celebrated the 100th anniversary of the Montessori movement. Millions of children, educated in Montessori schools around the world, owe their love of learning to Dr. Montessori.